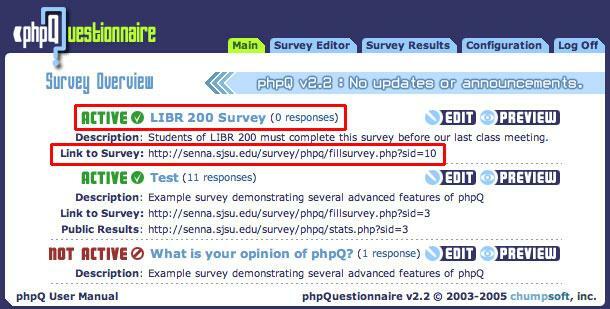 phpQuestionnaire allows you to manually activate and deactivate surveys. Setting your survey to Active makes it available for users to complete. Users will be able to access your survey through a generated link. If you wish to stop a user from taking the survey, or if the survey is currently in development, you should set the status to Not Active in order to prevent users from completing it. The survey, however, may still be previewed and accessed at any time. To change it’s active status, go to the Survey Editor. Under the Choose a Survey portion of the interface, make sure you select your survey from the Select Survey drop down menu.